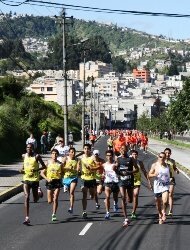 The 53rd edition was "La carrera mas grande del Ecuador," with a total of 22,000 participants in the new recreational 10km and 5km events and the always sold out 15km writes Alan Brookes. The race was developed as a gift to the city from El Comercio newspaper group and its "Final Edition". In sunny but cool conditions 15,000 runners took off from in front of the El Comercio offices at 09:00, led by an international field that included Peruvians, Mexicans, Columbians and two Mexican-based Kenyans — last year's champion Elisha Korir and Peter Lemayain. 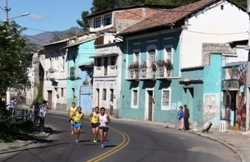 At 2850m altitude the race is a challenge enough, but also has few flat sections along the scenic point-to-point course from the south side of town through the magnificent Centro Historico, a World Heritage site, to the Olympic Stadium on the north side. The first, downhill kilometre saw a brisk 2:44 from a lead pack of 10. 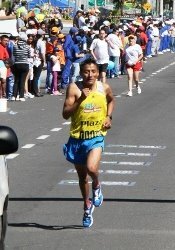 After 3km Peru's Raul Machacuay moved to the front pulled the pack along for the next kilometre in 2:51, then leading a charge up a lung-busting incline to hit 5km in 15:06. By then it was down to a three-man duel: Machacuay taking on Ecuadorian favourites Segundo Jami and Miguel Almachi. Jami and Almachi had placed 2nd and 3rd in 2011. The trio passed 10km in 30:55 with Machacuay doing all the work. At 11km Jami tried unsuccessfully to get away but after 12km Almachi surged decisively, covering the next kilometres in 3:02 and 3:01. He swiftly moved away from compatriot Jami, who faded a little in the final stages, allowing the courageous Machacuay to come back. Almachi crossed the Finish line on the stadium track 100m ahead of Machacuay. The women's race was far less of a contest, with Peruvian Olympian Ines Melchor finishing almost three minutes clear of compatriot and 2012 champion Gladys Tejeda. In fine festival style, the Finish line crowd were also treated to a great post-race concert featuring bands from the Dominican Republic as well as Ecuador. 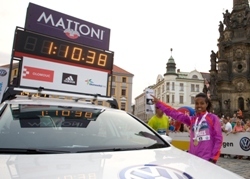 Warm and humid weather conditions kept times up in this second edition of the race but two promising young Ethiopian runners, 22-year old Tamirat Tola and 18-year old Hurtesa Kedija, both making their debuts in Europe, were worthy winners. By 6km Tola had already made a break, although he was subsequently caught. 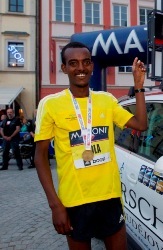 The winner of the recent Mattoni Karlovy Vary Half Marathon and hot favourite to win, Daniel Wanjiru, pulled out with muscle problems. Tola managed to break away from the leading group again with only Henry Chirchir chasing him. "He caught me up but 500m from the finish, I went for it and was able to shake him off." The lead group of four women stuck together through to 20km. Only in the last 100m did Hurtesa Kedija manage to overtake her compatriot, Shure Demise. 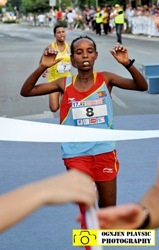 Sixteen-year old Letekidan Gebreaman from Eritrea finished third. Top Czech runners, Jan Kreisinger and Petr Pechek came in sixth and seventh but well off their best times due to the oppressive conditions. This year's event saw a record number of 2500 runners take part. In the relay event spectators enjoyed a duel between hockey and football league players in which champions on the ice, HC Mountfield emerged victorious, repeating their win of last year and earning themselves a barrel of beer from the Budweiser Budvar brewery. Race organisers donated the proceeds from entry fees from the Family Run to those affected by the floods in the nearby town of Putim. A minute's silence was also held in honour of the victims of this year's floods. 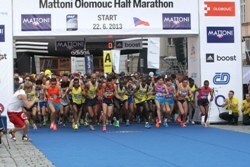 Next stop in the RunCzech series is the Mattoni Olomouc Half Marathon in two weeks' time. This unique race run alongside China's Mother River — the Yellow River — resonates with the theme of "Perpetual Pace" and the Marathon spirit. In the three years it has been held it has become the most popular race in Northwest China. The race organisation invited 24 elite foreign athletes to compete alongside 55 of the local elite, and 38 foreign runners made their own way to the event. Blistering sunshine and torrential showers greeted more than 550 participants in the Forest Marathon festival held in the beautiful Coillte Forest in Portumna, County Galway. The day started at 08:00 with the 100km, the 50km following at 10:00, and subsequent races at two hour intervals onwards. Participants in all events complete 5km loops of the forest which start and finish at the forest car-park amenity. The event is organised with the support of Galway County Council and is growing each year. 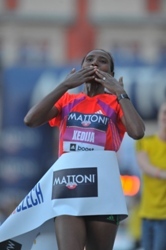 The women outshone the men in the fourth edition, as Betelhem Moges smashed the race record with a personal best. 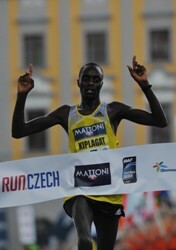 Henry Kiplagat finally won a RunCzech Running League race after three second places, although he had two wins in last year's series. Olomouc native Petra Kamínková achieved her personal "Olomouc" record with a time of 1:19:00. A record 3500 runners set off on the new course but race conditions were humid and hot. 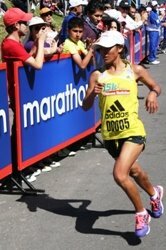 At 5km there was a lead group of five men; the women in contrast stuck together into the second half of the race. Kiplagat had a lead of 11 seconds at 15km. Moges only stole a lead over Yebrqal Melese in the last 500m. "I wanted to improve my personal best so I have a better chance of getting in races" she said. Kamínková was perhaps even happier than the winner. "Considering the weather I think it's a great result" she said. Czech Marathon Champion Jirí Homolác wasn't so pleased: "My time is really poor, but at least I defended the Czech title" he said. Spectators were able to check out performances by a number of well-known personalities including cardiologist, Jan Pirk, former athlete and wife of Olympian winner, Robert Sebrle, Eva Sebrlová, former Minister of Transport Jaromír Schling and opera singer Radek Leszczynski. The road race was preceded by races in which several thousand children ran — including 31 babies in a 10m race Hillary Kipchumba became the sixth consecutive Kenyan winner but searing temperatures of 37°C put paid to any fast times. Eritrean Samson Gezahai led through half way in 14:58, nine seconds ahead of Kipchumba and Ethiopia's Tolossa Chengere a further eight seconds back. 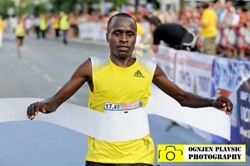 But 20-year-old Kipchumba caught Gezahai and went on to win in a time only three other men have bettered in Brcko. Swedish runners took both men's and women's titles in the 24th edition of the race under the Midnight Sun in Tromso. Running conditions were good: 16°C and no wind, but a little rain fell during the first part of the marathon. 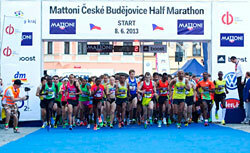 In total 4,500 runners entered for all distances, representing 62 countries.